The legal process of buying or selling a home, known as conveyancing, often takes around six to eight weeks. However, this is entirely dependent on the circumstances, including the type of property, any special considerations that have to be dealt with and the quality of the conveyancing service you use. There are various stages to the conveyancing process and a number of issues that can potentially delay the sale, making it hard to predict with complete accuracy how long conveyancing will take on a particular property. There are also various things a good conveyancing solicitor can do to help the process run smoothly and keep the total time for conveyancing down. Once an offer has been made and accepted on a property, there are various key steps that need to be taken to ensure the sale is legally sound and that both parties’ interests are protected. Drafting and reviewing the contract pack – The seller’s solicitors will produce a contract pack including all the information the buyer needs to know about the property and a draft of the contract of sale. How long this takes is entirely in the hands of the seller and their solicitor. Pre-contract enquiries – The buyer’s conveyancing solicitor will review the contract pack and query any issues they identify with the seller’s solicitor. How long this takes will depend on what, if any, issues the buyer’s solicitor finds and how easily they can be resolved. Property checks and searches – These are carried out by the buyer’s solicitor and typically include money laundering checks, local council searches, Environmental Agency checks and local planning searches. Most of these checks are relatively straightforward, but exactly which checks are required will depend on the particularly property, which can add more time. Checks and searches can also take longer if any problems are identified that need to be addressed. Exchange of contracts – Once both buyer and seller and their respective solicitors are happy with the final version of the contract of sale, both parties will need to sign the contract, then their solicitors will exchange the signed copies. This usually involves the solicitors reading the contracts out over the phone to each other to ensure they are identical, then immediately posting their copies to each other. Once this is done, the sale becomes legally binding. Completion – Both parties and their solicitors will agree a completion date in advance, which is the day on which the buyer will officially take possession of the property. Before this takes place, the buyer’s solicitor will need to notify them of how much is left to pay, arrange transfer of funds for the balance and sort out transfer of the title deeds with the Land Registry. One of the best ways to speed up the conveyancing process is by having an experienced conveyancing solicitor handle the process for you. They will know all of the requirements for the type of property you are buying or selling and the likely issues that could arise. This means they will be able to give you a realistic estimate of how long conveyancing is likely to take and they will be able to anticipate any likely delays and take action to minimise the impact on the timescale for conveyancing. If problems do arise which could hold up the sale, a skilled conveyancing solicitor will know how to solve these problems quickly, helping to get the sale back on track as soon as possible. 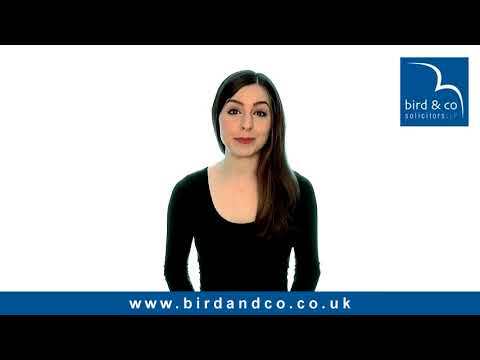 Bird & Co Solicitors is a long-established law firm offering conveyancing services for properties across England and Wales from our 3 offices in the East Midlands. We are accredited by the Conveyancing Quality Scheme run by the Law Society, which reflects the high quality of our conveyancing service. With years of experience in all types of residential property transactions, we can provide the fastest, most cost-effective conveyancing process possible, whatever your requirements.